As recently as a year ago, the Gulf cartel was considered the most powerful drug trafficking organization in Mexico. After nearly two years of taking the brunt of the Mexican government’s efforts, it is an open question at this point whether the cartel is even intact. The Gulf cartel’s headquarters and main area of operation historically has been the northeastern Mexican state of Tamaulipas. Through its use of Los Zetas, who operated for years as the cartel’s notorious paramilitary enforcement arm, Gulf trafficked large quantities of narcotics across the Texas border into the United States. The group’s symbolic leader is Osiel Cardenas Guillen, who led the cartel until his arrest in 2003. There are conflicting reports on who is presently in charge of the cartel. Some suggest it is Cardenas’ brother, Antonio Ezequiel “Tony Tormenta” Cardenas Guillen. These reports conflict with our previous assessment that the cartel is likely led by Jorge “El Coss” Costilla Sanchez. In any case, both men are thought to play a major role in the organization, and they may be sharing leadership responsibilities. Los Zetas were the primary reason for Gulf’s power. 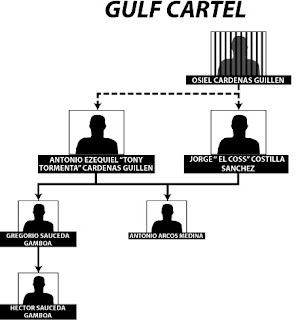 Following the extradition of Osiel Cardenas Guillen to the United States in 2007, rumors surfaced that Los Zetas were distancing themselves from Gulf. Reports of Zeta activity from this past year suggest that the split was complete by spring 2008. Though details on the current relationship between Los Zetas and Gulf are murky, it appears the two groups continue to work together, but that Los Zetas no longer take orders from Gulf.